On October 14, 1981 Muhammad Hosni Sayyid Mubarak assumed the Presidency of Egypt following the assassination of President Anwar El Sadat. He is the longest-serving Egyptian ruler since Muhammad Ali Pasha. He announced today that he will not resign but will handover power to Vice President Omar Suleiman ,however, he will no longer run for office. 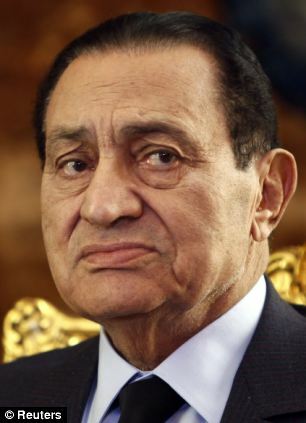 On Feb 4, 2011 there was a failed assassination attempt on Egypt’s vice president left two of his bodyguards dead. Since January 25, 2011, for a total of 17 days, a popular uprising from the people of Egypt called for his resignation as president of Egypt due to corruptness and illegal activities that the government was associated with. Because of inflation, many Egyptians are currently struggling to feed themselves as the country’s food crisis is beginning to spiral out of control utilizing anywhere between 40 to 60 percent of their wages going to food. Zimbabwe has claimed that China is ready to pour $10 billion (£6.2 billion) into its ailing economy. If the figure is true, what might Beijing want in return? When Yang Jiechi arrives in Harare on Thursday, for the first visit by a Chinese Foreign minister in a decade, he is almost certain to be bearing gifts. After almost three years in which China has publicly shied away from Zimbabwe, there are signs that Beijing has its eyes, once again, on the country’s rich mineral reserves. Since the deadly elections in 2008, which forced Robert Mugabe, Zimbabwe’s president, to form a “unity” government with his opponent Morgan Tsvangirai, relations have cooled while Chinese officials hedged their bets over the country’s leadership and squirmed in the fierce glare of international condemnation. “China gets embarrassed when embarrassing details become public,” said Philip Barclay, a former British diplomat in Harare and the author of Zimbabwe, Years of Hope and Despair. “And the Chinese weapons shipment which arrived in 2008, just at the time when violence broke out around the Zimbabwean elections, was very embarrassing. They really did not like that,” he added. On Thursday, however, Mr Yang is likely to start negotiations over a significant injection of Chinese investment. According to Tapiwa Mashakada, the Zimbabwean Economic planning minister, Mr Yang may be carrying with him as much as $10 billion of investment from Beijing. “We have met with officials from China Development Bank and they have said they are willing to invest up to $10 billion,” he said, at a business conference in Harare earlier this month. “The Chinese are looking into mining development, that is exploration and exploitation, agriculture, infrastructure development and information communication technology,” added Mr Mashakada, a member of Mr Tsvangirai’s Movement for Democratic Change party. Previous rumors suggested, however, that the money on the table is actually a $3 billion loan from China’s Export-Import (Exim) Bank. Both sums dwarf previous Chinese investments in Zimbabwe, and Mr Mashakada’s claim represents more than twice the value of Zimbabwe’s entire economy last year, and more than all other Chinese direct investments in Africa in 2009 put together. “It is a pie-in-the-sky figure,” said Mr Barclay. “It is much larger than previous Chinese investments and when they do invest money, the Chinese expect concrete benefits, usually closely linked to concessions,” he added. More likely are targeted deals, perhaps for Zimbabwe’s platinum and zinc mines. Zimbabwe has the second-largest reserves of platinum in the world after South Africa. Details of the Exim bank deal reported in Zimbabwe’s respected “Independent” newspaper cite documents proposing a “master-loan facility” aimed at resuscitating Zimbabwe’s struggling economy after years of hyperinflation and disastrous government policies. In return, China reportedly wants control over platinum deposits currently owned by the Zimbabwean government in the Selous and Northfields concession covering 68 square miles and valued at between $30 billion to $40 billion. More controversially, China may also have its eyes on the Marange diamond fields in Chiadzwa. In late 2008 the Zimbabwean military is alleged to have seized control of the fields, shooting illegal miners from helicopter gunships. Currently, a small proportion of the diamonds from this vast mine are certified by the Kimberley Process to avoid being tagged as “blood” diamonds, but a much greater quantity is thought to be bought up by dubious traders with profits flowing to Mr Mugabe’s Zanu-PF. China already mines one alluvial diamond concession at Chiadzwa in partnership with the government under the banner of Anjin Investments. There have also been rumors that China may be involved in further illegal mining activities, but they have never been confirmed. In addition, some Chinese investment could flow into agriculture. China imports a significant quantity of tobacco from Zimbabwe, and may have one eye on a future source of food for its growing middle class. Around 5,000 Chinese workers live in Zimbabwe, and the two countries have a relationship stretching back to the founding of Robert Mugabe’s Zanu-PF, whose Marxist revolution was partly funded by Beijing. Over the years, China has found it easy to do business with a country that was run along similar lines, with Zanu-PF’s politburo making unilateral decisions. It is not clear if dealing with the unity government and Mr Tsvangirai’s MDC party will be to Beijing’s taste, but for Zimbabwe there seems little option. Millions of people in northern Kenya are facing hunger and an uncertain future as a drought continues to destroy their crops and livestock. The drought is also taking its toll on the population’s health and the number of malnourished and ill, increases by the day. And there seems to be little respite. With no rains forecast over the next three months and the government saying that the country’s food reserves are dwindling fast, some in this region might not make it through. Al Jazeera’s Mohammed Adow reports from Turkana, in Kenya. The chairman of a House oversight committee on homeland defense has labeled “inexcusable” the TSA’s continued refusal to release it’s internal reports on the safety of radiation firing airport body scanners. “The public has a right to know, and there isn’t something so sensitive that requires holding it back,” Rep. Jason Chaffetz, R-Utah. tells USA Today. US diplomats also feared that Chinese companies were selling materials to Iran that could be used to build nuclear missiles and other weapons of mass destruction. 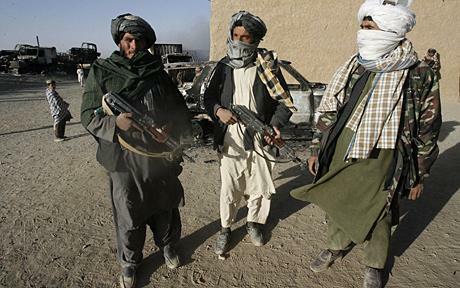 Chinese-made guns, as well as rocket-propelled grenades and surface-to-air missiles containing Chinese-made components, have all been used against Coalition forces or civilian targets in Iraq, the US claims, while other weapons have been obtained by militants in Afghanistan. The US was so concerned about Chinese arms and components being sold to Iran that in September 2008 the State Department launched a major diplomatic offensive to put pressure on Beijing. It decided to share intelligence with eight “key allies” including Spain and Italy to “persuade China to enforce its export control laws more effectively” and to “aggressively implement” UN Security Council resolutions on the sale of arms and weapons materials. Ambassadors were told to encourage the foreign governments to point out to the Chinese that arms sales to Iran “could ultimately damage China’s reputation and its bilateral relationship with” each of the countries. Over the past few months, there’s been a buzz surrounding rare earth metals. These are metals such as europium, lanthanum, neodymium and 14 others found in small concentrations attached to other metals and resource deposits. They’re actually not that rare, just expensive and difficult to pull out of the ground. These naturally occurring elements are essential in everything from wind turbines to lasers to iPads. Rare earths are a conundrum for the environmentally conscious—they hold the key to green energies but create toxic waste when being separated away from other elements. “Just one wind turbine generating 3 megawatts of electricity requires 600 kilograms of rare earths for its magnets,” a source told the United Kingdom’s Guardian newspaper. Electric and hybrid cars can contain more than twice as much rare earth metals as a standard car. 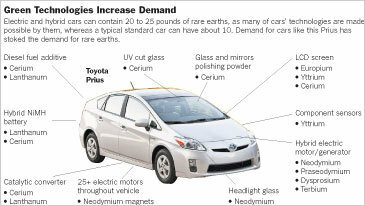 This image from the NY Times breaks down how these metals make up critical elements of a Prius. Currently, China controls 97 percent of the world’s production of rare earth metals. In October 2010, the country cut exports of the metals by 70 percent, disrupting manufacturing in Japan, Europe and the U.S., and sending the prices of these metals up 40 percent. CHICAGO — A vast network of high-tech surveillance cameras that allows Chicago police to zoom in on a crime in progress and track suspects across the city is raising privacy concerns. Chicago’s path to becoming the most-watched US city began in 2003 when police began installing cameras with flashing blue lights at high-crime intersections. The city has now linked more than 10,000 public and privately owned surveillance cameras in a system dubbed Operation Virtual Shield, according to a report published Tuesday by the American Civil Liberties Union. At least 1,250 of them are powerful enough to zoom in and read the text of a book. The sophisticated system is also capable of automatically tracking people and vehicles out of the range of one camera and into another and searching for images of interest like an unattended package or a particular license plate. 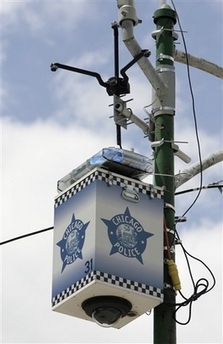 “Given Chicago’s history of unlawful political surveillance, including the notorious ‘Red Squad,’ it is critical that appropriate controls be put in place to rein in these powerful and pervasive surveillance cameras now available to law enforcement throughout the City,” said Harvey Grossman, legal director of the ACLU of Illinois.